Combs are the most common wedding veil attachment and they can work in all hair types. Some hairstylists prefer to attach the veil with loops, so we offer loops. If you want your veil attached directly to your tiara, headband, barrette or decorative comb, we can do that. For mantilla veil attachment you can also choose a simple straight pin. You will receive tips on how to attach a wedding veil when you receive your veil. With our instructions veil attachment is secure even in fine hair and short hair. We make detachable veils too! Bridal Veil Combs are the most used veil attachment. The comb is hidden under the veil. With our veil attachment tips a veil comb can securely attach a veil to any hair type or style. 3.5 inch clear plastic comb: Our standard comb has many smooth teeth, so it slides in and out smoothly. This bridal veil comb is a nice size. 4.25 inch clear plastic comb: works well when a less full effect is desired, more width helps the gathers spread out and lay flatter. This comb has the same shape as our 3.5 inch comb. 3.25 inch wire metal comb: often brides with thick hair perfer a metal comb. Our metal veil comb is flexible and the teeth are wire loops. Loops for Bridal Veils are elastic bridal loops, often used with bridal buttons on wedding dresses. 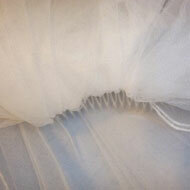 The loops are sewn under the top of the veil instead of a comb, hairpins can then be used to attach the veil. When wearing a Tiara, decorative comb, barrette or headband it’s often best to still have the veil on a separate comb. Having the veil separate allows you to move it to the best position in your hair, which is often a bit behind the tiara. There are times when it is best to have the veil attached directly to the hair accessory. We can attach your veil to your tiara, comb, barrette or headband. We can also make it detachable, so you can wear your tiara without a veil at the reception. This is a great option for longer 2 or 3 tier bridal veils. Remove the long tier for the wedding reception to enjoy freedom of movement. This is usually done with hidden Velcro so the detachable tier may be removed without disturbing your hair style. We can customize your detachable veil according to your needs; just email us your situation. You can choose to attach your mantilla veil with a comb or with a pin. Our 2 inch long straight pin allows you to attach a mantilla veils from any point on the veil. Position the mantilla where you want it and then weave the pin in and out through both hair and veil. A pin is a nice movable attachment because you could wear part of the mantilla over your face as a blusher and later switch it to attach at the edge and hang straight back. Some brides have used bobby pins instead of our straight pin.